Single leaf from a short work on the Passion of Christ, Carrying the cross, Walters Manuscript W.731, fol. W.731r, originally uploaded by Walters Art Museum Illuminated Manuscripts. This leaf, created in Southern Germany ca. 1475, contains illustrations to the Sext and None segments of De Septem Stationibus Passionis Christi. This anonymous text, written in rhymed verse, was often appended to the Speculum Humanae Salvationis, which may have ultimately been the context for this leaf. 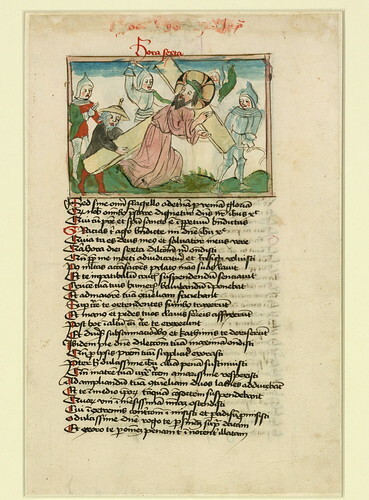 Written and illuminated on paper, the effect of the images with their heavy ink outlines and washes of color closely mimics that of colored woodcuts from the same period.